What sneaker was actually banned by the NBA? We've been led to believe that the black and red colorway of the Air Jordan 1 was banned 31 years ago. But was it really? The Air Jordan 1 is a mysterious shoe that originally released in all sorts of colorways, and in order to gather the history and evolution of the brand, we must first look back at its roots. "A player must wear shoes that not only matched their uniforms, but matched the shoes worn by their teammates." At the time, red and black was much more rebellious than plain black and white shoes, and first-year NBA commissioner David Stern "threw them out of the game." Legend has it that MJ continued wearing the pair anyway, while Nike footed the bill. Does this story sound familiar to you? Let's take a look at an interview conducted by legendary late night talk show host, David Letterman. Fast forward to 4:48. Here is a letter written by then-NBA Executive Vice President, Russ Granik, addressed to Nike Vice President, Rob Strasser. 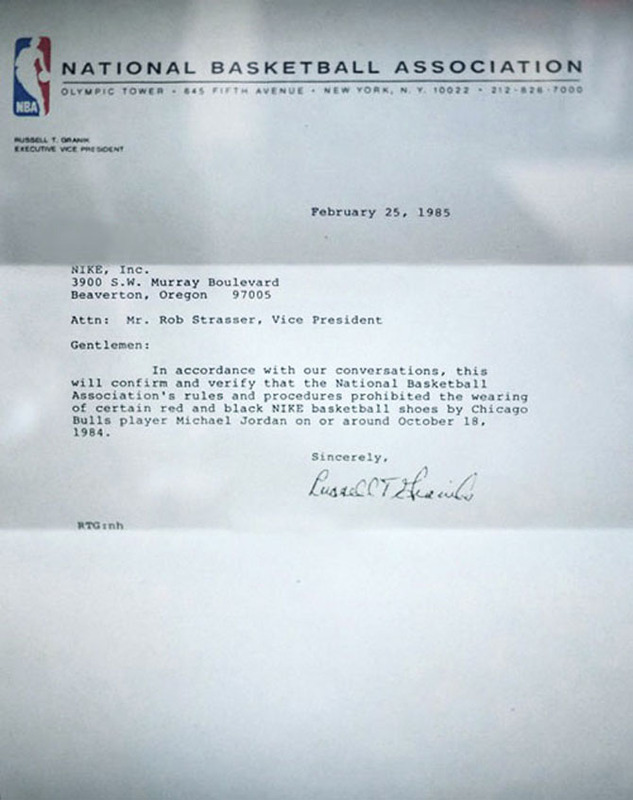 It states that Michael Jordan wore a certain pair of Nike basketball shoes that violated the league's rules and procedures on or around October 18, 1984. There are so many questions to be asked. For one, how many games did MJ wear the Black/Red Air Jordan 1? And did Nike really pay said imposed fines? And here's the biggest question: Was the Black/Red Air Jordan 1 even the right sneaker that was first "banned" by the NBA? I've had regular discussions with people on the matter. In particular, bigbostrong on Instagram, who has provided detailed pictures of Air Jordan history, as well as our friends from Australia, Adam Ryan and Aaron Stehn—both of whom who run a popular podcast on inallairness.com. A mutual colleague of theirs, Adam Howes, runs bullsonparade.me and does the same, but with all focus on the rich historical events of Michael Jordan and Chicago Bulls history. We have already scratched the surface as to what MJ first wore during his rookie campaign, which is identified as the Nike Air Ship—a mysterious shoe that has yet to be retroed. 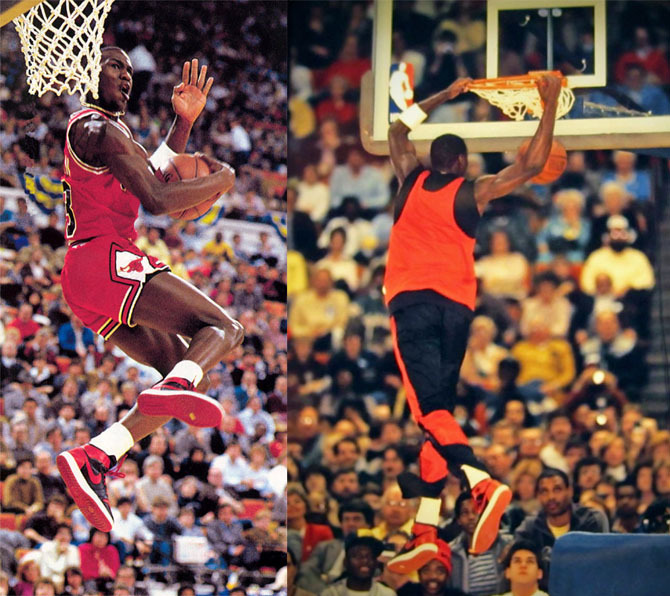 To my knowledge, Jordan wore three colorways of the Air Ship: White/Natural Grey, White/Red and Black/Red. And that Black/Red version of the Nike Air Ship is the actual sneaker that was banned, not the Air Jordan 1. Jordan did however had a PE edition of the Air Ship, which read "Air Jordan" on the heels. 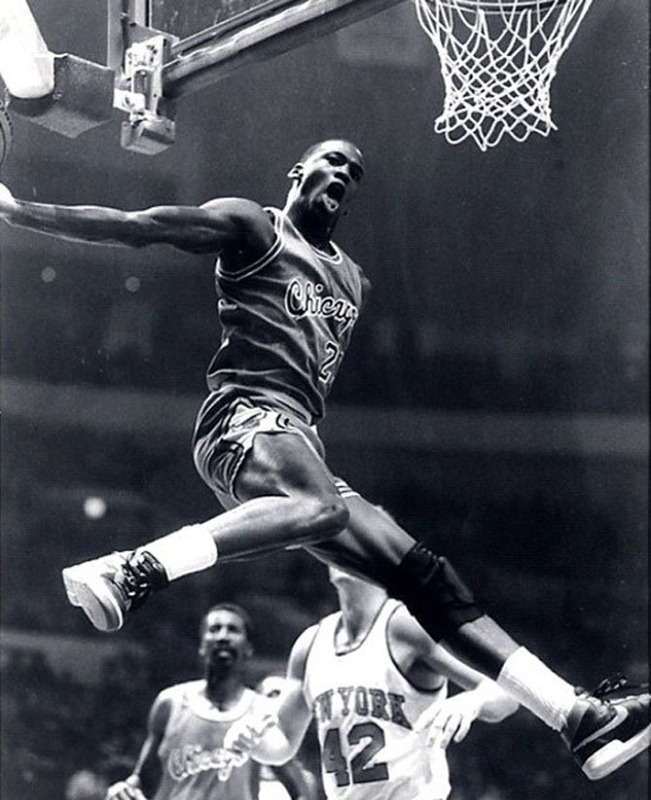 Here is Michael in a 1984 preseason game against the New York Knicks wearing the Black/Red Nike Air Ship. The game was played on October 18, 1984 at Madison Square Garden. It was the 6th preseason game the Bulls had played, and they were going into the game with a 4-1 record. A few days earlier on October 15, 1984, the two teams played each other at Glens Falls, NY some 200 miles north of Madison Square Garden. The NBA notified Nike and/or the Bulls that the black and red sneaker from the October 18 game broke the "uniformity of uniform rule." He would immediately have to stop wearing the colorway on court. In this YouTube video, you can see Michael wearing the Black/Red Nike Air Ship during practice at Madison Square Garden from a interview conducted on October 18, 1984. Fast forward to 0:26. The game following is the regular season debut at Madison Square Garden on November 8, 1984 with Michael wearing the White/Red Nike Air Ship. There have been no pictures surfaced of Michael Jordan ever wearing the Black/Red Air Jordan 1 in an NBA game. I've been analyzing this mythical story for a some years now, and have even challenged our Jordan forum to provide a picture and/or video of Michael wearing the shoes. I've been presented with all sorts of unique attempts such as the 1985 NBA Slam Dunk competition, to Patrick Ewing in a one-on-one match up, to screenshots of Michael from the "Just For Kicks" documentary of 2005. Let's break down each attempt. The 1985 NBA dunk contest doesn't count since it wasn't an NBA sanctioned game. It does however suggest that the NBA may have again warned the Bulls superstar and Nike for breaking the "uniformity of uniform rule." Referencing back to the letter, it was dated February 25, 1985. All Star festivities began on the weekend of the 10th. It may suggest that a second warning did take place, but no evidence has surfaced regarding any imposed fines the NBA may have issued—something we can perhaps research at a later time. The matchup between Jordan and Ewing was for the cover of the November 1985 issue of Inside Sports magazine, and utilized for promotion of the 1985-86 NBA season. It simulated the matchup between the previous Rookie of the Year (Jordan) versus the potential (and eventual) Rookie of the Year (Ewing). 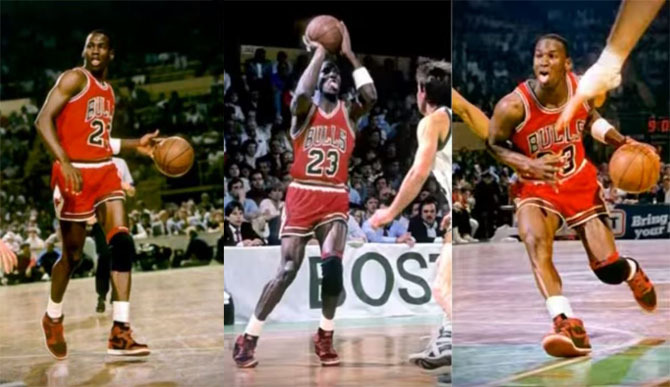 Jordan continued to wear the White/Red Air Jordan 1 in the 1985-86 NBA season, before and after his foot injury. The documentary Just For Kicks again attempted to align the notion that Jordan was fined for wearing the shoes. But there has yet to be evidence by Nike or the NBA that proves that the violation ever took place. These screen captures from the documentary were modified. Photos of the game were taken from the first round of the 1986 NBA playoffs against the Boston Celtics in which Michael scored a playoff record 63 points. It still stands as a record today. Keep in mind that the uniform style worn during Michael's rookie season were different. The road jerseys consisted of black script lettering for Chicago along the chest and the home jerseys with the Bulls team name in red. 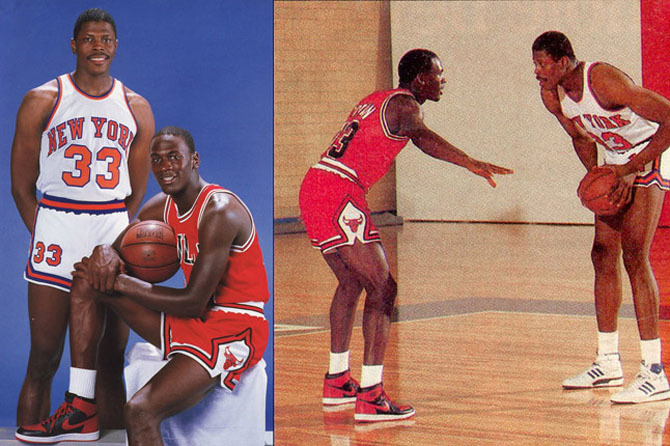 After the 1984-85 NBA season, the Bulls sported a new uniform style which is similar to what Jordan wore throughout his illustrious career. So there you have it—the true story behind of the actual "banned" sneaker. It was not the Air Jordan 1, but indeed the Nike Air Ship in the Black/Red colorway. Perhaps someday we'll come to understand how Nike strategically rolled out the "banned" campaign. We can only wonder if we'll ever get a retro of the Nike Air Ship—which seems like a possiblity after it was finally offically acknowledged by Jordan Brand in 2014. Whether or not the Air Jordan 1 was banned, the myth is most definitely a part of sneaker history, and the precursor to what Jordan Brand is today. Are These Michael Jordan's Original "Shattered Backboard" Sneakers?